Lighter than air and utterly delicious Chocolate Eclair Cake Recipe for when your tooth craves something sweet. 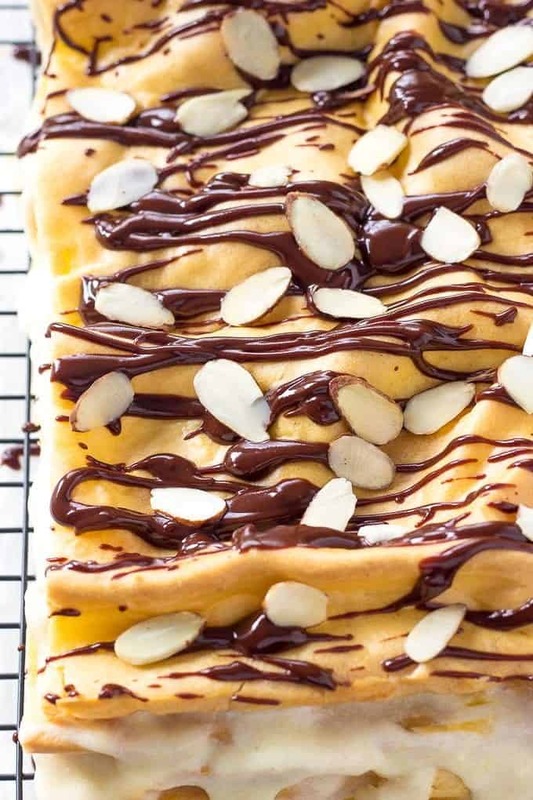 Distant relative of traditional Chocolate Eclair, this beautiful dessert is perfect for special events or weekend baking with the kids. 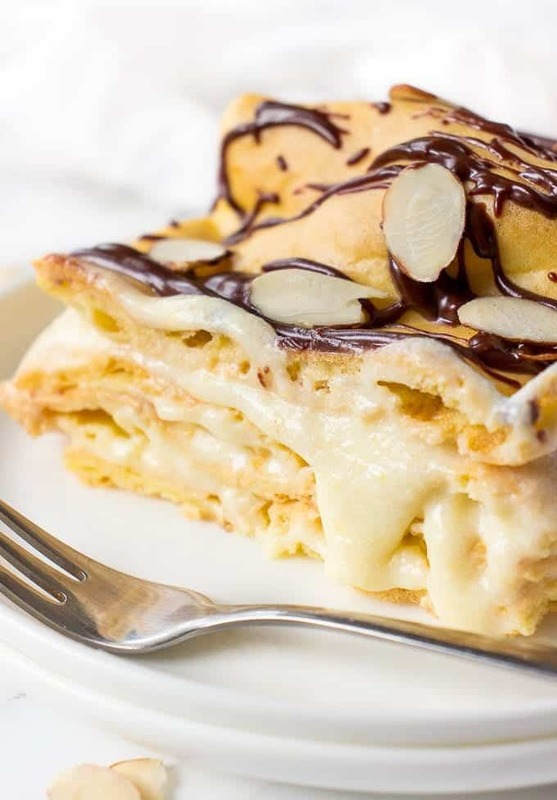 Friends, this post has lots of useful information so keep reading to make the Best Eclair Cake ever. Yes, I’m obsessed with Eclairs and consider them to be my favorite (and probably most often cooked dessert) ever. After my original Chocolate Eclair recipe went bonkers on Pinterest, I decided recreate it but in a form of cake. The pastry cream recipe is also slightly different and perhaps a little easier to make. This Eclair Cake comes out big in size and with lots of delicious wavy layers. It’s great for parties, special events and unlike traditional chocolate eclairs, it doesn’t require the use of pastry bag. Oh, and did I say it is absolutely delicious? This Chocolate Eclair Cake is unlike anything you’ve ever tried before and feels like a cloud melting in your mouth. Seriously, it’s that good! In addition, it’s so beautiful and reminds me of another traditional Polish dessert Karpatka. In fact, the recipe is very similar to Karpatka but the pastry cream is much lighter and softer. My Chocolate Eclair Cake recipe doesn’t use Graham Crackers in its ingredients. Because if you can make such a yummy Choux pastry from scratch, I don’t see the need in Graham Crackers. Today I’ll walk you through all the steps to help you make the Best Eclair Cake Recipe ever. In a medium saucepan add milk and half portion of the sugar and bring everything to a low simmer. Add the remaining milk, whisk until smooth and transfer everything back into the saucepan. Bring everything to a low boil and cook for one minute. Remove custard from the heat, transfer to the heatproof bowl, cover with a food film and place on a counter to cool off. Add flour and using a wooden spoon whisk vigorously until no lumps remain. You should work the dough until a thin film forms at the bottom of the pot. 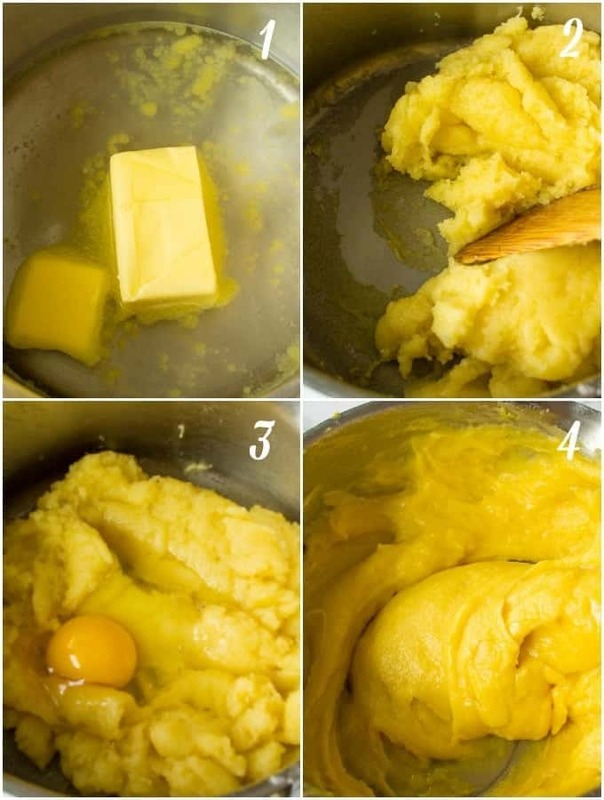 Whisk in the first egg and mix with a wooden spoon until the egg is fully incorporated into the dough with no white lumps. Continue whisking in the remaining eggs, one at a time. 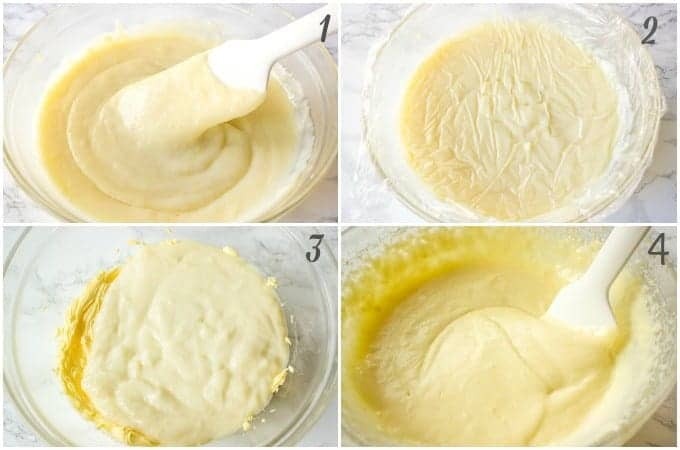 Your Pâte à Choux should be smooth and elastic. Cover the baking sheet with a parchment wrap. With wet hands arrange half of the dough on the baking sheet and smooth it out. You might need to wet your hands a few times as dough is a bit sticky. The layer will be very thin and that’s all right as it will puff up during baking. Don’t worry about imperfections. Bake in a preheated to 375 F oven for 15 minutes. Without opening the door!, reduce the temperature to 320 F and continue baking for 18-20 minutes until top is slightly golden brown. 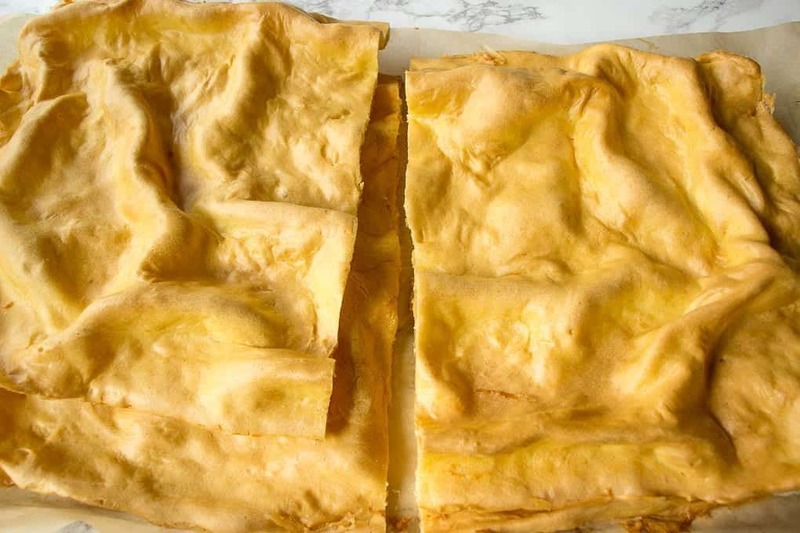 Remove from the oven, slide Choux Pastry on a clean kitchen towel and either cool off the baking sheet to arrange the remaining dough or use another baking sheet. 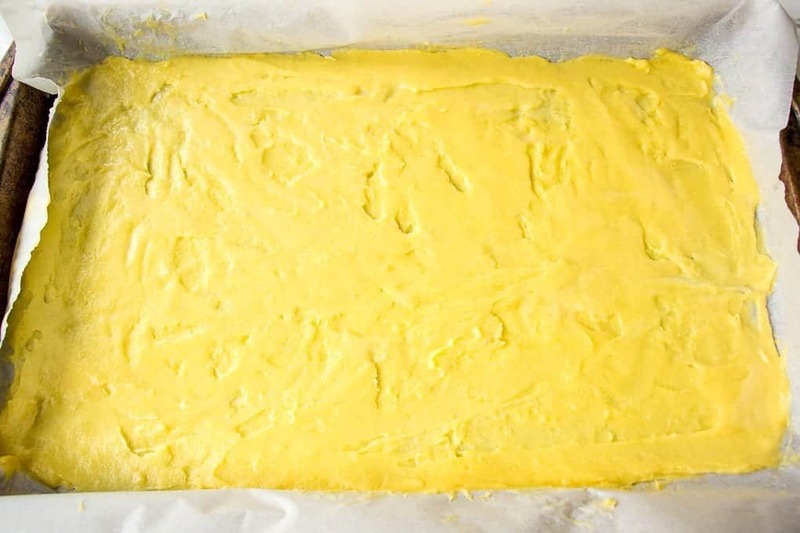 Liberally spread 1/3 of pastry cream over the first layer of Choux Pastry. Repeat layers. Top with remaining cake layer. You won’t regret spending some time making this scrumptious cake. It’s absolutely irresistible! If you make my Eclair Cake Recipe, snap a photo and post it on Instagram with a hashtag #lavenderandmacarons. I’d love to see your creations. That is so gorgeous! A very creative recipe indeed. This looks absolutely amazing, I’ve always shied away from making eclairs at home, but this cake looks like something I can make! I love this creative way to easily make an eclair flavored dessert for a crowd! Okay, seriously, I didn’t think it could get much better than a chocolate Eclair — but, Eclair cake!? Yes please! The step-by-step photos are so helpful. Looks like an involved process that is worth every second. I love it! 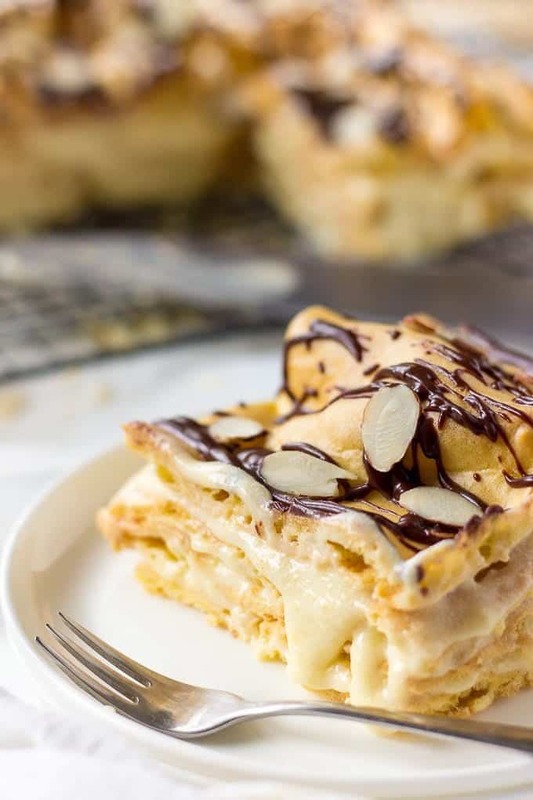 Saving this yummy eclair cake recipe for sure, absolutely scrumptious! Oh my goodness, this recipe sounds INCREDIBLE! 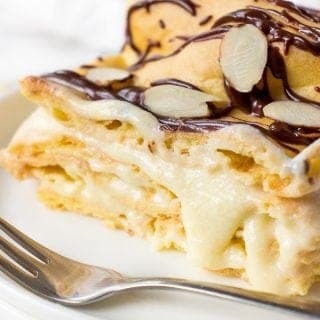 I have seen so many recipes for eclair cakes that sounded nothing like eclairs or choux pastry, so I am so glad to have found your recipe. It is exactly what you would expect from a cake made out of eclair ingredients and techniques!